Thymio II is an awesome little robot with over 20 sensors, 40 lights, 2 motors, and LEGO integration. Kids love Thymio because it is personable and inspires thought and creativity, and grownups love it for just the same reasons. Scroll below for more information. 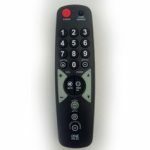 Remote Control- allows you to control Thymio wirelessly. 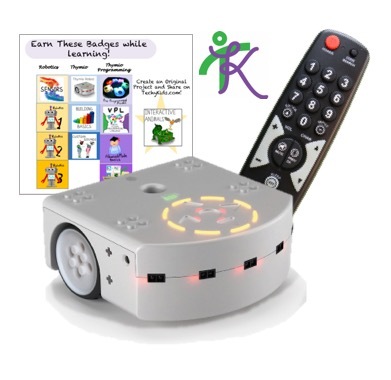 TechyKids Beginner Thymio Online Course & Scratch with Thymio Course – Gives you access to login and take our online course, complete with videos, badges, quizzes and create your own original project! Perfect for the classroom or home. This set includes everything you need to do fun projects with Thymio! 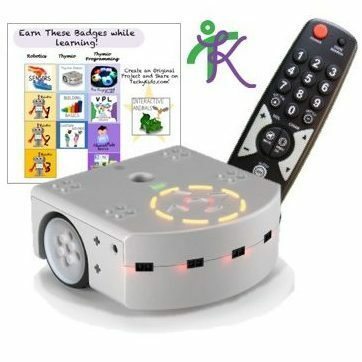 Set includes the Thymio Robot, remote control (to control Thymio from a distance), and “Getting Started with Thymio” online course. Rechargeable Battery that charges while you program! 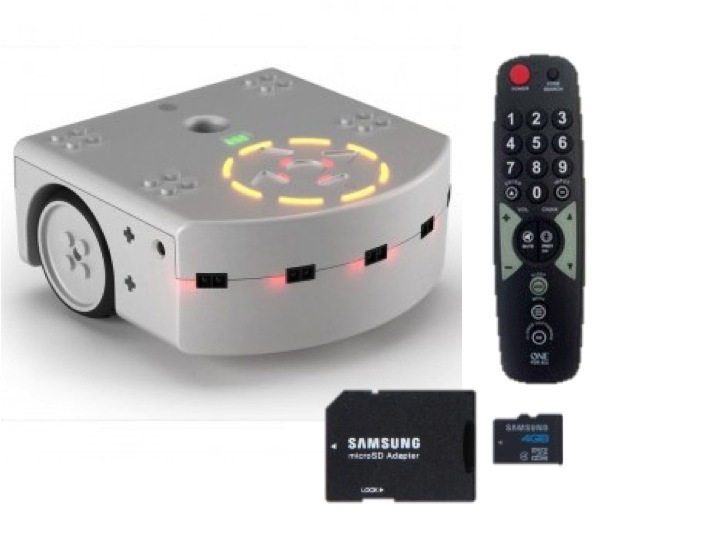 Thymio can be controlled with a remote control! We’ve already tested and created the instructions for this remote so you can plug and play. This is the perfect accessory to projects that you wish to control from a far. 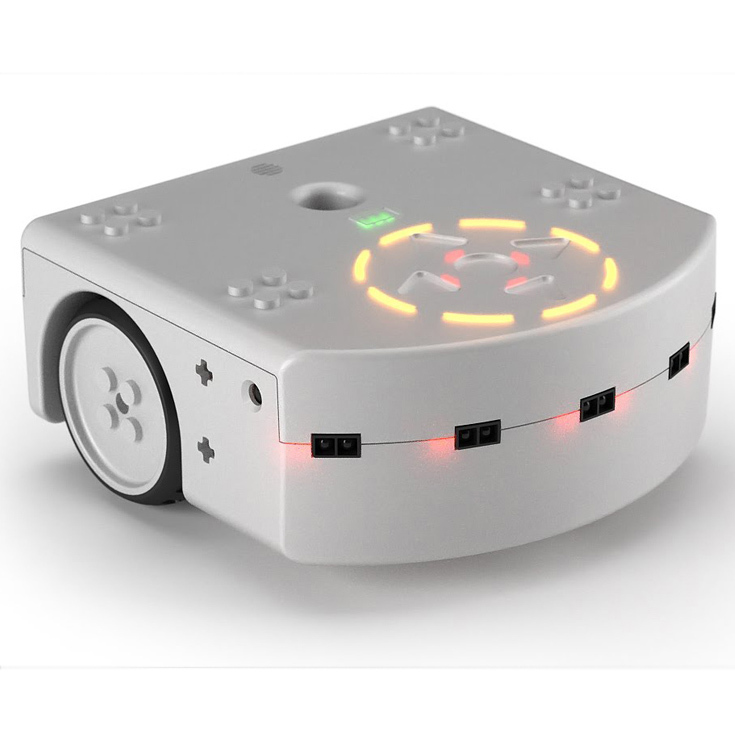 This instantly turns Thymio into a remote controlled vehicle in one of the pre-programmed modes! Go ahead, create your own project creation with this fun accessory…then with your off time- drive your friends crazy as you change channels on them while they root for their favorite sports team ;-).